Yes, Rome has a zoo. 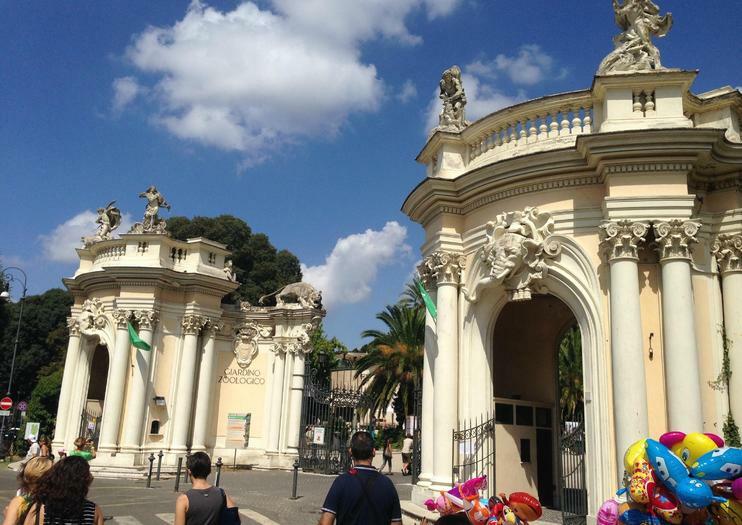 It is a zoological garden with more than 1,000 animals located on the original site of the Villa Borghese. Open since 1911, it began as a place to collect and display animals in danger of extinction. Paths winding through the park allow visitors to observe lions, elephants, tigers, monkeys, and giraffes, among others. There is also a small barnyard area with goats, pigs, cows, and other livestock. Most notably the bio-park is home to a rare Kleinmann’s tortoise, which was rescued from a smuggler's suitcase in 2005. Bioparco has been renovated and renamed from its original construction to illustrate its commitment to ecological practices and scientific knowledge. There is a small lake with seating to relax as well as a children’s area. All in all there are more than 200 species on the 17 hectares of zoo land here. It is one of Europe’s oldest zoos still in operation. Bioparco is located on Viale del Giardino Zoologico at the Villa Borghese estate. It is easily accessed on foot from the Spanish Steps or Piazza del Popolo. The nearest metro stop is Spagna. Open from 9:30 am to 5 pm, it costs 15 euros to enter. Hours: Open daily from 9:30 am - 5 pm. Extended hours to 6 or 7 pm during summer months. Take a tour of Rome’s Villa Borghese gardens with a local guide, and then visit the city zoo of Bioparca di Roma at your leisure. It’s a combo experience that has something for all the family. Check out the park’s Elizabethan-esque playhouse, and hear the history of the sprawling gardens, which date back to the 17th century. At a time that suits you, use your Bioparco di Roma ticket to see tigers, lions and more at the ever-popular zoo. Il giardino zoologico d Roma nasce nel 1908 con l’obbiettivo primario di divertire il pubblico ed era ben diverso da quello attuale di carattere didattico e scientifico, infatti il concetto odierno di giardino zoologico è notevolmente mutato, trasformando la visita in una opportunità per conoscere, capire e di conseguenza rispettare l’ambiente che ci circonda.La vista del Bioparco vi permetterà di scoprire circa 200 specie animali fra mammiferi, uccelli, rettili e anfibi provenienti dai 5 continenti, oltre all’ importante collezione botanica, composta principalmente da specie mediterranee e arricchita negli anni da centinaia di specie esotiche. Take a tour of Rome’s third largest city garden, Villa Borghese, and enjoy a delicious picnic in the park during this half-day tour. Stroll through the 80-hectare space and admire pond, the statues, the terraces, and of course, the beautiful plants. Visit the Terrazza del Pincio and enjoy a delicious lunch while taking in the scenery of the park. Discover Rome without leaving a big carbon footprint with this Segway tour of the city center, led by a professional guide! You'll have your choice of all sorts of tour options long and short, with stops at some of the Eternal City's most fantastic piazzas, fountains, and buildings along with off-the-beaten sights not seen by the average tourist. Breathe in the beauty of Villa Borghese, Rome’s largest public park, on a guided bike tour. This monumental complex of gardens takes its name from 15th-century art patron Cardinal Scipione Borghese and boasts the stately Gallery Borghese art museum, a picturesque lake, ornate monuments, and ancient ruins. Pedal around highlights including the magnificent Lake Gardens, fountains, statues and temples, and the elegant gallery, home to works by Caravaggio and Bernini.